TEPSMIGO Magnetic Wooden Fishing Game is a unique and fun game for little ones to play. This game teaches, counting, colors and coordination. Have your child pick up the purple seahorse, green fish, orange starfish and more! Use the enclosed wooden dice to have your children take turns rolling the dice and picking up that many of the sea creatures! 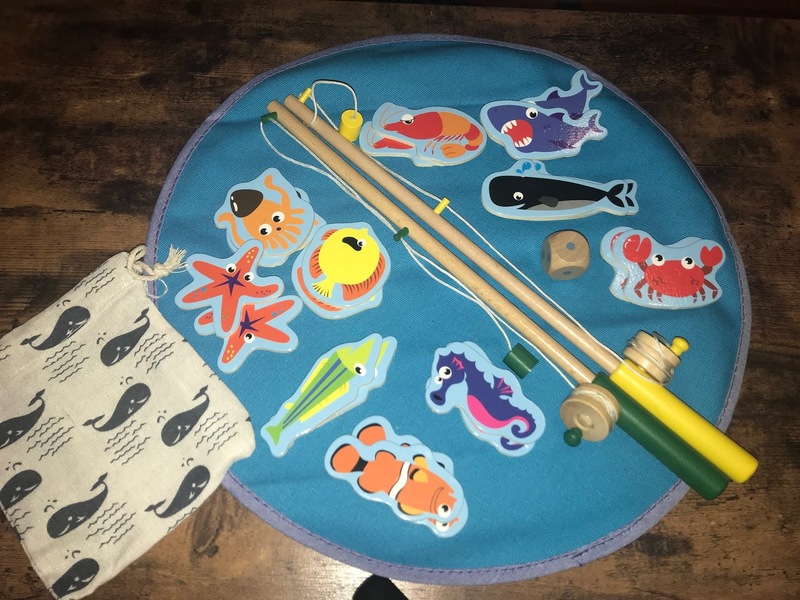 Each set comes with 2 wooden fishing poles, 20 magnetic sea animals, a cloth fishing pond and a whale patterned carry case for your magnetic sea animals. This is a beautifully made set that will bring so much fun your little ones. The colors are vivid, the pieces are strong and durable, and the set is easily portable. This set is available at Amazon. Disclosure: I received this set to review for my honest personal opinion. I was not required to write a positive review, however I did because I find the quality of this product to be very good. This post contains affiliate links.